For over half a century, more than 39 million Americans have turned to J.K. Lasser for easy-to-follow, expert advice and guidance on planning and filing their taxes. Written by a team of tax specialists, J.K. Lasser's Your Income Tax 2013 includes all the outstanding features that have made this book the nation's all-time top-selling tax guide. It covers some of the most important topics associated with your taxes, from what must you report as income and strategies that will save you on taxes to how much tax do you actually owe and what deductions can you claim. As an added value, you can gain direct access to bonus materials through jklasser.com, including links to the latest tax forms from the IRS, up-to-the-minute tax law changes, small business help, and much more. Filled with in-depth insights and timely advice, this is the guide of choice for today's serious taxpayer. 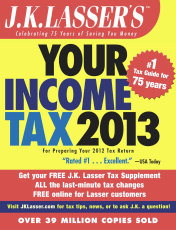 Filled with practical tax guidance you can't find anywhere else, J.K. Lasser's Your Income Tax 2013 will help you plan and file your 2012 tax return in the most efficient way possible.